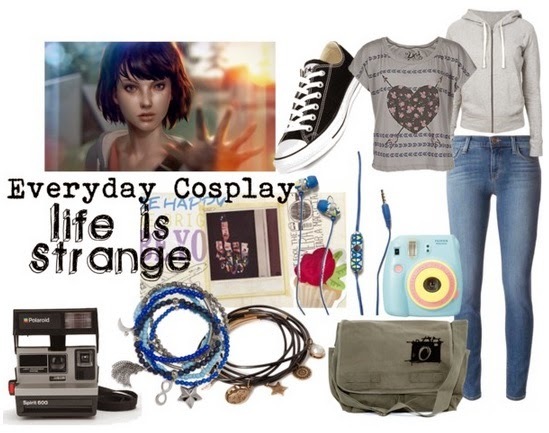 Continuing on with my current obsession surrounding the episodic video game series Life Is Strange, I thought I would put together an Everyday Cosplay layout for the main character Max Caulfield, just for fun! I know most of the shirts Max has worn so far have had some sort of Doe decorating the front, but instead I settled for this shirt (which is made by a company called Doe I believe) that I thought suited her. And instead of the basic blue and black elastics I found some charm bracelets of the same colour that aren't too fancy. Max of course loves her Analog camera, but I also added an Instax Mini 8 camera because I thought if she had access to one of those that she would have a blast with it, and she'd be able to take some pretty cool photos. I couldn't resist including that messenger bag as well XD And I picked a pair of earbuds with a little extra colour. So there you have it! Let me know what you think in the comments below.